Again, a beautiful day and rough seas. That meant, for the third consecutive day, we would be diverted from the advertised destination. Of course, the travel literature warned of changes caused by bad weather, but it was irritating nonetheless. Portofino and Monaco were the two "highlights" on the schedule. 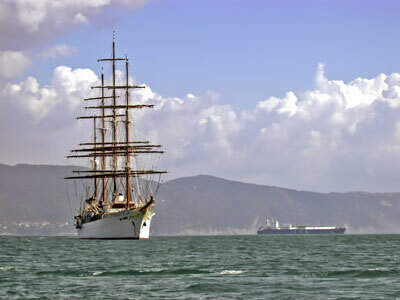 We headed down the Ligurian coast, past the Cinque Terre (Five Lands), to Portovenere and entered its sheltered harbor. 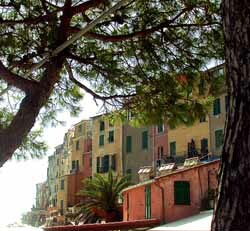 This is a charming town, with very tall houses along the Calata Doria, or the quay. The houses, up to six or eight stories high, were built in the Middle Ages as defense towers directly above the harbor. When under attack, villagers could exit the rear of the upper stories for the safety of the castle above. Off a leafy plaza, we found some steps and set out to see where they led. A steep climb took us up behind a 16th century castle, Castello Doria. The view of the sea and the town were magnificent, but there was no way for us to get into the castle. Turns out, the steps we climbed were the beginning of a hiking trail into the rugged hills stretching northward to the Cinque Terre. So, down we went and looked for a different path to the castle. Above the quay, Portovenere has two narrow streets with shops and entrances that lead to the upper floors of the houses on the waterfront. We continued upward to the 12th century Church of San Lorenzo, which holds the town's revered relic, the Madonna Bianca, said to have floated to Portovenere in the 13th century inside a log. Higher up still was the castle. Inside was an art exhibit and outside wonderful vistas of the harbor and sea. Even a small orchard with chairs for quiet contemplation while viewing the scene. Below was the town cemetery, "Byron's Grotto", and the Church of San Pietro. We walked down to the cemetery. I have always been fascinated by French and Italian cemeteries. 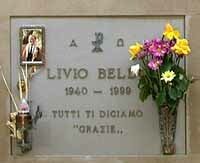 It is the custom to place a photograph of the deceased on the tombstone, a record of the person buried there. Perhaps a wedding photo of a bride taken decades before her death. An old lady may be stern and formal, or smiling and jolly. An old man, or a young soldier. Dressed in one's Sunday best, a uniform, or in everyday clothes. The photo may be current, or it may have been taken decades ago. We encountered the Surrey Four at the cemetery. 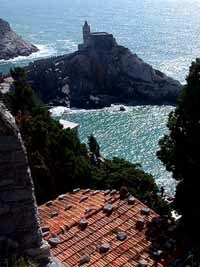 They had been to Portovenere once before and were thoroughly enjoying experiencing it again. Pauline took a picture of us all together. We continued down the hill and sat out on a flat promontory overlooking the Grotto Arpaia, listening to the surf beat against the rocks below. Then we walked down through the town and to the Grotto itself, which was filled with trash. 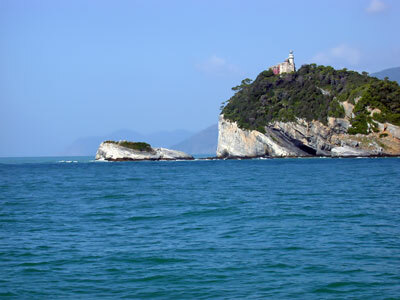 This is the point Lord Byron was supposed to have begun his long swim across the Gulf of Spezia to meet Shelly at Lerci. Thus the nickname "Byron's Grotto." Nearby, at the edge of town and overlooking the sea, is the tiny Church of San Pietro, built on the site of a 6th century pagan shrine. The church is painted black and white, a centuries-old landmark for fishermen at sea. Al noticed that the esplanade near San Pietro seemed to be made of slabs of marble. Certainly marble is more common in Italy than in the U.S., but could it be used as paving stones? I took a sample home for brother David to analyze. Along the waterfront, there were cats everywhere: windows, doorsteps, walls, shops, lounging, sleeping, creeping, stretching, heads in bowls. One shop had nine felines relaxing out front. After some gelato and more walking, we took the tender back to the ship for a short rest. Then, at dusk, we headed back into town for dinner at a pizzeria. Most of the tourists had left and it was quite pleasant to sit outside on the patio and enjoy a quiet meal. Some of the sailors from the Star Clipper were also at the restaurant. The ship lifted anchor at 10:00 and set sail. 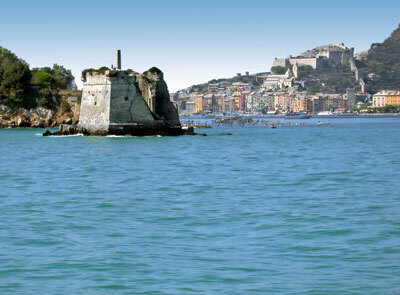 Portovenere, "Port of Venus", had been a very pleasant surprise.